A $17.3 million project by the Alabama Department of Transportation to relieve congestion opened up to traffic earlier this month, five months ahead of the projected date. Recognizing the need for increased traffic capacity to ease up congestion in the highly traveled Memorial Parkway (U.S. Highway 431) in Huntsville, ALDOT decided to construct overpasses at Max Luther and Sparkman drives to fix the problem in one of the city's busiest corridors. Construction began in August 2009. ALDOT, working with Reed Contracting Services, Inc. and Miller & Miller, Inc., was able to plug away at the overpasses, knowing local commuters and area businesses were looking to have this job completed as soon as possible. ALDOT was able get a quick start and capitalize on good weather to finish so far ahead of schedule. A ribbon cutting ceremony was held Monday, April 9 to celebrate the opening of traffic, a great relief to drivers who have been dealing with orange barrels and closures for years in anticipation of the new overpasses. "This is an important project to reduce congestion and enhance safety in an area that creates a significant impact on Alabama's economy," said ALDOT Director John Cooper. "As stewards of taxpayer resources and Alabama's system of state and federal highways, it's essential that we continue planning projects that give us new capacity and smarter ways to commute while also maintaining our existing infrastructure. This project is an example of how we are achieving the right balance between those equally important parts of our mission." 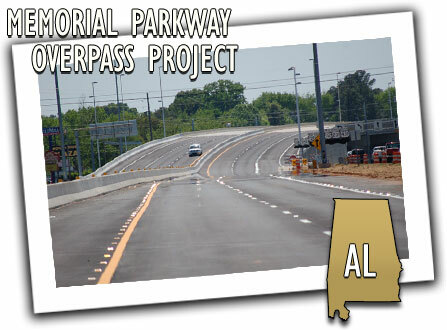 The Memorial Parkway overpasses will still require some finishing touches by ALDOT, but will be finished around drivers without disruption.